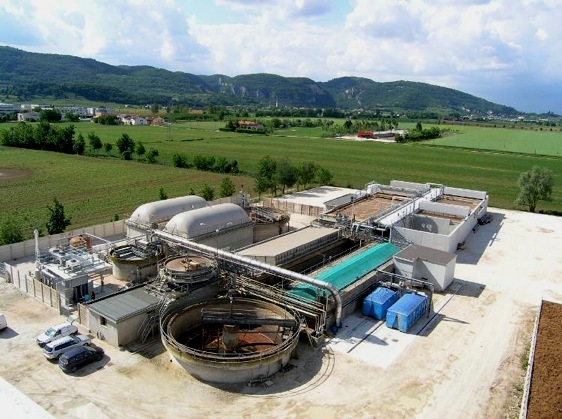 This chicken farm waste plant in Italy uses a two-state nitrification-denitrification process. Denitrification is a key process in water treatment. What is it, exactly? Nitrogen can be found throughout nature and the environment. Gaseous nitrogen is by far the prevalent component of the air we breathe. It’s present in living organisms as well as in decaying matter, such as humus. Nitrogen in aquatic environments, such as water treatment facilities, can take the form of dissolved nitrogen gas, ammonia, nitrites, or nitrates. Denitrification is the conversion of nitrates (NO3) to inert nitrogen gas (N2). It’s the final step in the nitrogen cycle, a combination of natural processes by which nitrogen transforms from one form into another. Denitrification is the process whereby nitrogen is removed from water. When employed in water quality improvement technologies, denitrification treats water to reduce its nitrate-nitrogen content to potable levels. Nitrates contribute to the total nitrogen content of wastewater. Many sources contribute to the nitrogen load, including wastes from food processing and chemical processes. But most of the nitrogen found in wastewater is from urea, a product of urine. In addition to its use in the treatment of sewage and municipal wastewater, denitrification can also be used to remove excess nitrate from groundwater that may be present from over-use of fertilizers. Denitrification can also be applied to treat liquid wastes, such as might be present in industrial-scale agricultural operations. In Italy, for example, a poultry farm uses biological denitrification as part of its operation to treat manure prior to disposal. There are three principal approaches to nitrate removal: ion exchange, chemical reduction, and biological denitrification. The mostly widely used of these treatment processes, according to the World Health Organization, are ion exchange and biological denitrification. Typically, ion exchange is used to treat groundwater, while surface water is commonly treated using biological denitrification, according to the World Health Organization. Ion exchange is a specific chemical process in which unwanted dissolved ions — in this case, nitrates — are exchanged for other ions with a similar charge. This exchange occurs when water is passed over a bed of resin beads. Let’s concentrate on biological denitrification, which uses microbes to do most of the heavy lifting. Bacteria that can use oxidized nitrogen — denitrifiers — commonly used include Pseudomonas, Alcaligenes, and Paracoccus. When they break down NO3 to metabolize oxygen, nitrogen gas is released. In biological denitrification, denitrification is one of two steps in the nitrogen removal process carried out by bacteria. The first of which is nitrification. Then, denitrification converts the nitrate into nitrogen gas. Denitrification is […] employed to convert the nitrate-nitrogen in the effluent from the activated sludge-nitrification process into nitrogen gas. Denitrification takes place in the deep bed, mono-media denitrification filters. A supplemented carbon source (methanol) is added to the denitrification filter influent to provide a food source for the denitrifying culture in the filters. Once the water enters the filters, it passes through the bacteria-laden filter media. Once the bacteria have consumed the oxygen in the nitrate, nitrogen is left. As it is released, the gas is trapped in the filter media, removing most of the nitrogen from the wastewater in the process. Because there is little to no oxygen remaining after denitrification, the next stage in wastewater treatment is adding oxygen to the water through aeration. Excess nitrogen contributes to eutrophication. Fresh water that is too nutrient-rich — either from naturally occurring nitrates or phosphates, or from fertilizer runoff or sewage discharge — becomes a breeding ground for toxic algal blooms. These events pose a particular challenge for water treatment and desalination plant operators worldwide. In some areas of the United States nutrient-related pollution has adversely affected water quality, making denitrification essential. Across the state of Iowa, nitrates are such an ongoing threat to water quality that new wastewater treatment infrastructure is needed to fully address it. The city of Des Moines, for example, spent an additional $1.5 million on denitrification in 2015. Bill Stowe, chief executive officer and general manager of the Des Moines Water Works, told WaterOnline that he expects another $80 million to be spent on infrastructure upgrades, including for denitrification. Wastewater treatment plants play a critical role in reintroducing nitrogen back into this cycle with limited environmental impact. High levels of nitrogen entering natural waterways can result in toxic conditions for wildlife, dissolved oxygen depletion, and excessive algae growth — all harmful to local plant, animal, and human populations.